Have you been enjoying the last few weeks of summer? I have been, which is why this post is a few hours late...SORRY!.... 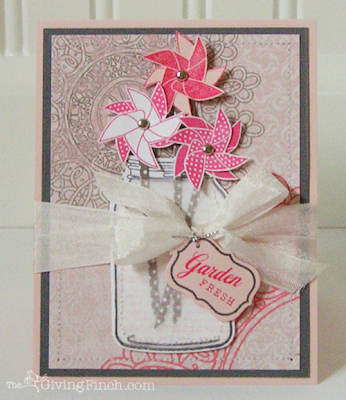 I know last weeks challenge was a tough one - using flower images as inspiration without using flowers....I'm kinda sneeky that way.... You all showed us some AMAZING creations, but I'm going to have send my Top Talent Award this week to Shannon Finch of The Giving Finch! I love that she used the 'idea' of flowers in a vase with those adorable pinwheels, super cute! Don't forget to get to have Fun with Fruit and get those fruit creations done for this weeks challenge. Love seeing you in our 'corner' of the blogosphere! Congratulations Shannon! Your card is a real winner! GORGEOUS design! 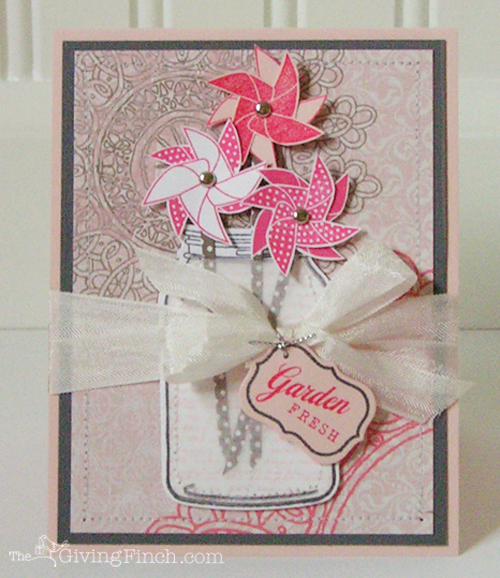 Kristin - thanks so much for choosing my card! I had a great time participating in my first OCC challenge. Thanks for the nice comments ladies! Congratulations Shannon. Your design is really nice. I wondered if I missed the Winner for the Color Challenge of Aqua and Red from July 30th? I went back and don't find a post on that.